Difficulty: YDS class 2 plus too much sulphur gas! How to get there: This report describes the ascent of Etna from the south side, there is also a north approach which we did not explore. However, it may very likely be less crowded by tourists and provide an equally good approach. A more detailed Trip Report with more photos is also available. The south side trailhead and tourist area is called Rifugio Sapienza, elevation 1904 m, location N37:41.959, E015:00.017. There are many signs from the coastal area and on the east and south slope of Etna that directs tourists (cars) to this place. Route description: From parking at the trailhead, go up to the building that serves the cableway. Just below it a gate blocks the dirtroad that continues higher. This dirtroad will take you to the top of the cableway in many curves, alternatively, just follow it a short way, then take the more direct line uphill on the ski slope. The ski slope does not have a trail, but the rocks are mostly small and ok to walk on with boots. The top station of the cableway is about 2 km from the trailhead at elevation 2500 meter, location N37:43.099, E014:59.944. From here, the dirtroad continues uphill to Terre del Filosofo. The straight line distance is 2.2 km, however the road has many (zig-zag) turns along the way. Terre del Filosofo is at elevation 2939 meter, location N37:44.279, E015:00.037. This is a far as tourists can get by the 4WD bus transport offered from the top of the cableway. From here, we hiked a circular route visiting three (out of four) high points on Etna as will be described below. This route or part of it can be reversed, the main consideration is the activity of Etna and the prevailing wind. 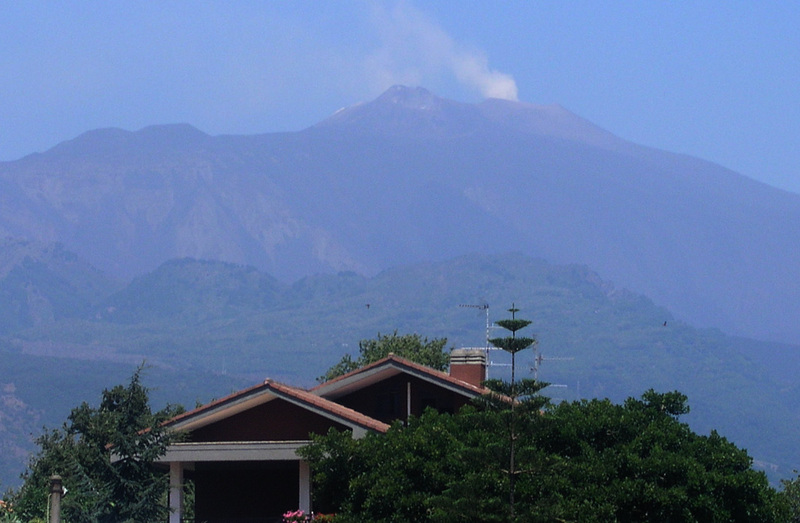 If Etna is quiet enough to proceed, then consider the amount and intensity of smoke coming from its main crater. This smoke has enough sulphur in it to be dangerous in high concentrations and in any case irritating and uncomfortable to breath in low concentrations. One would be well served to take a simple gas mask (active coal filter) along as standard equipment on this climb. The essential aspect of route planning must be to avoid the gas and have escape routes in mind in order not to get caught in this smoke (due to a change in wind direction or a change in volcano activity) without a (very!) quick way out. From Terre del Filosofo, a nice trail (jeep road) traverses on the west side to a trail junction with the trails arriving from the north slope. This junction has elevation 3110 meter and location N37:45.323, E014:59.315. This junction is likely the best point of departure for climbing the main summit craters with the exception of the South-East crater which is most easily reached directly from Terre del Filosofo. Since the terrain and craters are in constant change, any more detailed description must be quite recent in order to be accurate and valuable. Please see the Trip Report from my climb in July 2005 for further details. Remark on elevations: The highest point on Etna shifts both in location and in elevation with the various eruptions. There are several "competing" craters near the top of the volcano, eruptions make the crater rim grow in height, while relatively calmer periods tend to cause collapsing walls resulting in somewhat reduced height. One crater may be collapsing while another nearby crater keeps erupting and thus adding meter to its height. This link seems to provide a pretty good overview of the history and current status of Etna. 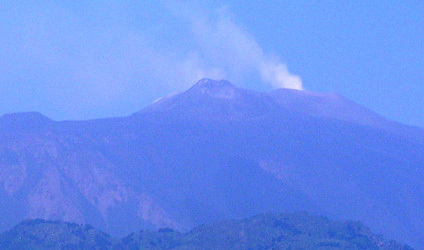 The North-East crater became the highest point of Etna in the period 1978 to 1986 and again since 1996. The crater self-destructed during a violent eruption in 1986, and temporarily lost its highest point distinction. The South-East crater was not born until 1971. Just from 1997 to 1998 its elevation increased by more than 50 meter. It was reported to reach 3300 meter in 2001, while we maeasured it to 3294 meter in 2005. It has been the site of numerous violent eruptions also after year 2000 and may certainly be a future candidate for hosting the highest point on Etna. Comments: I did this climb with my son Pål Jørgen, age 16. We drove from our hotel at the Mediterranean (just north of the village Acireale), at 0415, started hiking at 0520, it took us 2 hours to hike to the point Terre del Filosofo, where tourists can go by cableway plus a 4WD bus. The cableway did not start until 0900, so it was only Etna and us. The continued hike had to cross an area where the sulphurous smoke from the crater came down the slope, it was not too bad, but caused some coughing. We were indeed happy to put this behind and continued to the trail fork on the north-west side of Etna, reaching it at 0830. From here, we headed straight up to a saddle between what appeared to be the two highest points. The M5 trip continued the next day with ascent of Montalto. Etna, 3326 meter dominates the east cost of Sicily. 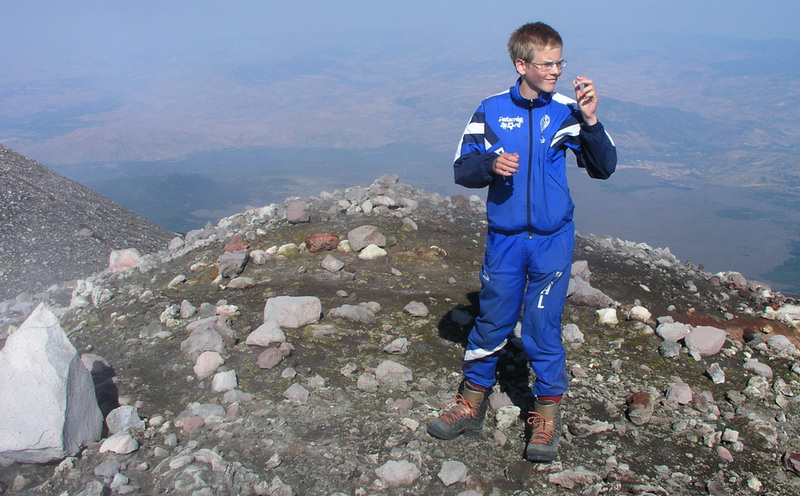 Pål Jørgen on a North-East crater rim high point.